our home is ready for Christmas. 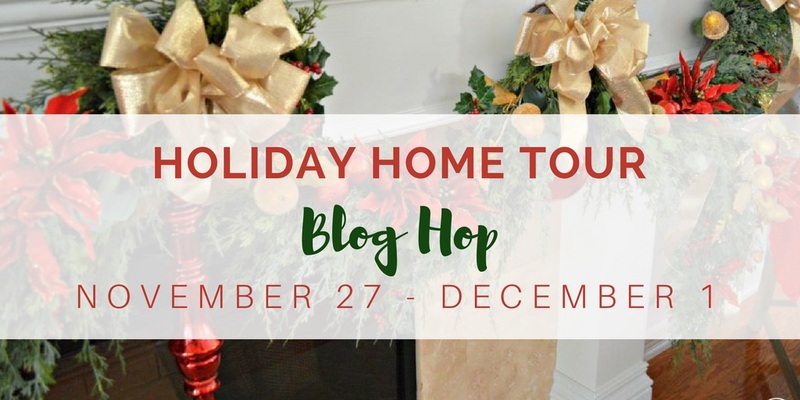 I am joining Chloe Crabtree and many other creative bloggers for Celebrate & Decorate's Holiday Home Tour blog hop. 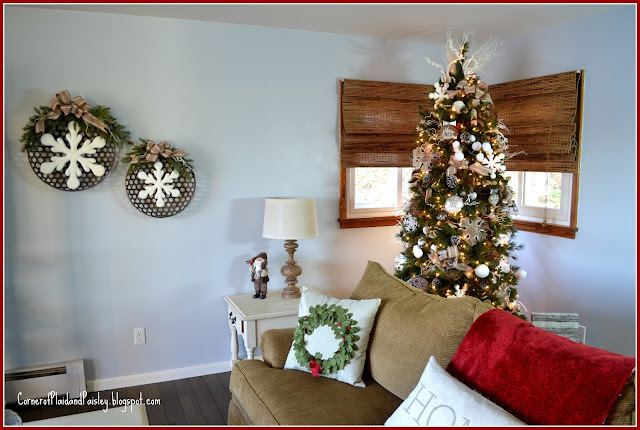 There is a ton of inspiration here if you are looking for ideas to decorate your home for the holidays. I will have all the links at the end of my post. I am going to start in the kitchen for my little tour. We have a very open floor plan, the only thing separating the kitchen/eating area from the living room is our two sided fireplace that stands in the middle of the room. 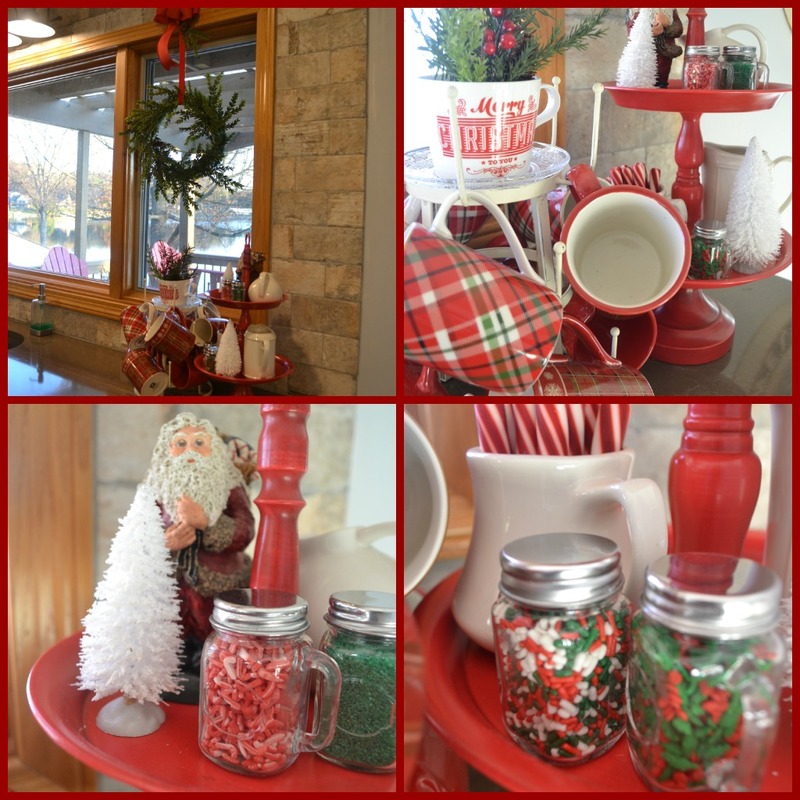 I used a lot of red accents in the kitchen. I kept it pretty simple in the work areas of my kitchen. 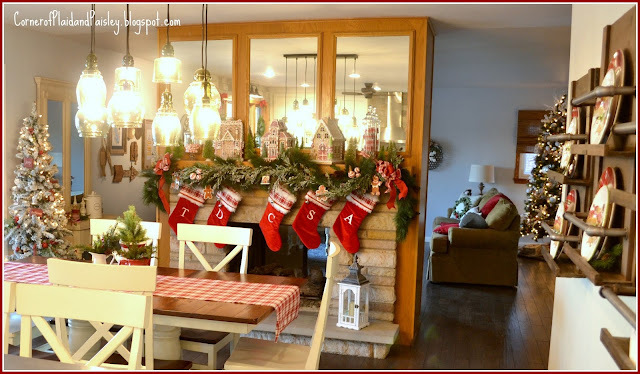 and hung the majority of our stockings on the kitchen side of the fireplace. We have a small flocked pencil tree in the kitchen/dining side done in simple red ornaments. Our hutch kind of bridges the kitchen/dining area to the living area. 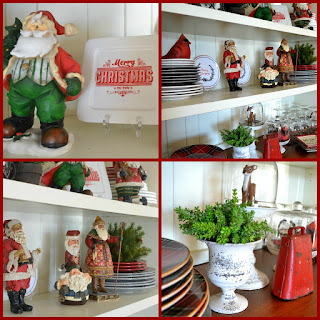 I have a few of my favorite Santas joining some Christmas plates in the hutch. Now, we are heading into the living room where I decorated everything with more natural, earthy tones and items. Lots of snowflakes since we live in northeast Ohio! The snowflakes inside the baskets were my favorite project this Christmas. I have had these snowflakes for years and have used them many different ways, but this is my favorite yet. And starring (get it!!) our newly painted fireplace! You can read about our fireplace redo in my previous post. The Holy Family is taking center stage on our mantel. Well, I hope you enjoyed the tour! Just so you know, no animals were hurt during this decorating, but there are two dogs who are sick of listening to me sing Christmas music at the top of my lungs as I have been decorating!! Have fun as you decorate your home for the Holidays. I wish you a very festive Christmas! so please stop by and check out the other beautiful homes. Ann, I love your open space and how you've remodeled it so! The kitchen is done well, and leaves the space to work which is ideal. That hutch connecting the spaces - oh my! Those kinds of style spaces are my very favorite and yours looks great with so many wonderful Santas. The greenery on the LR mantel side looks so nice and full, and the paint job really gives it a fresh, new appearance. 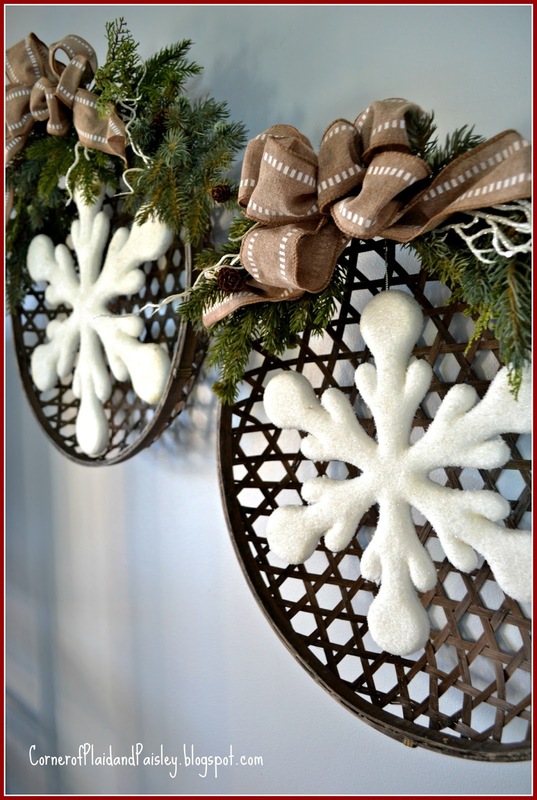 The snowflakes in the baskets are great (love the baskets!). You are ready for when that cold wind blows and the snow flies in NE Ohio, for certain! Happy Holidays! Your home looks just lovely Ann! 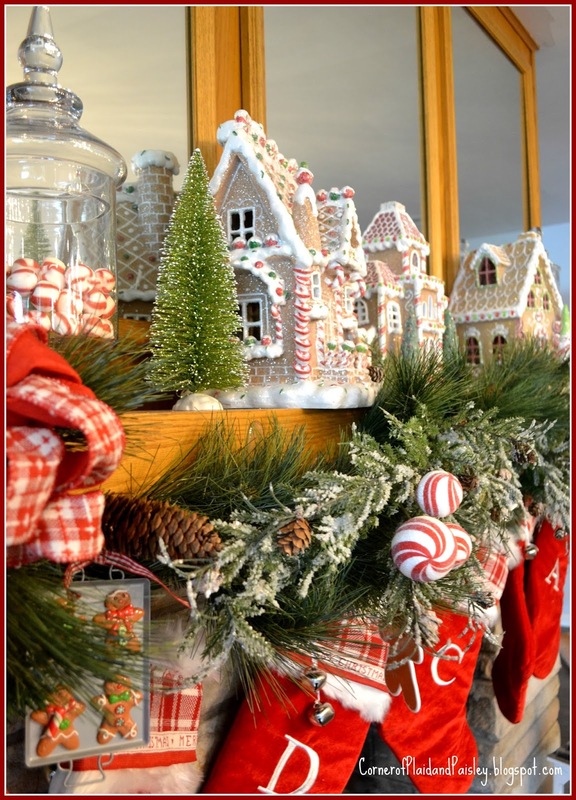 You certainly are ready for Christmas, I love all the natural decorations and the woodland elements in your living room, but I must say your red and white kitchen with the gingerbread house mantel is where you'd find me! It is so cozy and evokes memories of childhood anticipation at the wonderful things to come during the season! Have a Merry season! Ann, Your home is warm and inviting. I love the layout that you can enjoy the fireplace from both kitchen and living area. Your gingerbread house collection is adorable. I have fond memories of making houses with my children. Your hutch is a great area to display your Santa collection and Christmas dishes. 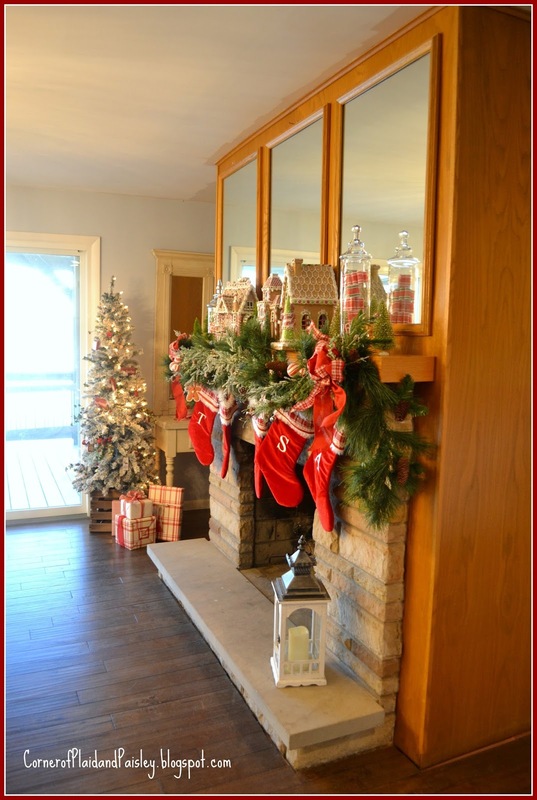 Your mantel in the living area is equally beautiful decked with greenery and your Nativity. I do get the stars over the mantel with the Holy family taking center stage. Your knitted white stockings are pretty and I love your snowflake theme even in your cozy throw. Ann, I love love love what you did with your fireplace. All the extra effort was certainly worth it. Your decorating is unlimited now. The nativity speaks to my heart. I adore the red and white kitchen...so homey. 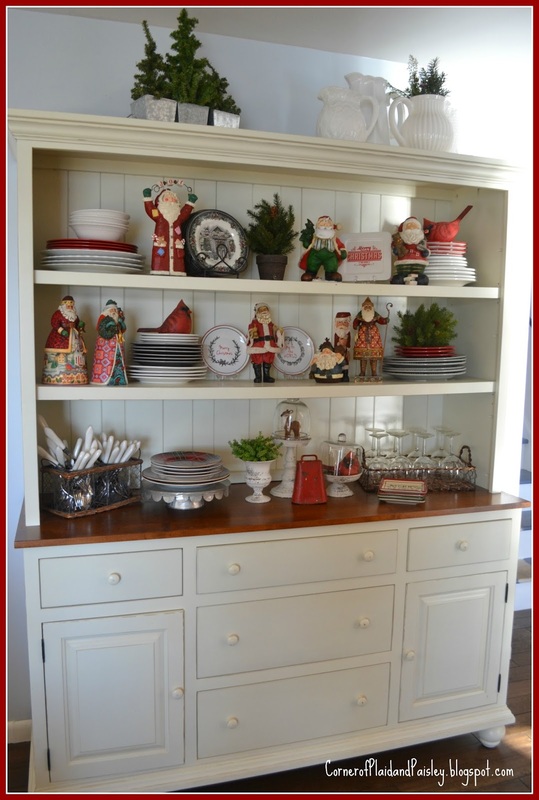 Your hutch really tells all it is Christmas at your beautiful home. It is always fun blog hopping with you. I love all the greenery on your mantle and red never looked so good. So cute and festive. It was so fun to blog hop with you! I love the Holy Family on your mantle with the stars. It looks beautiful!!! 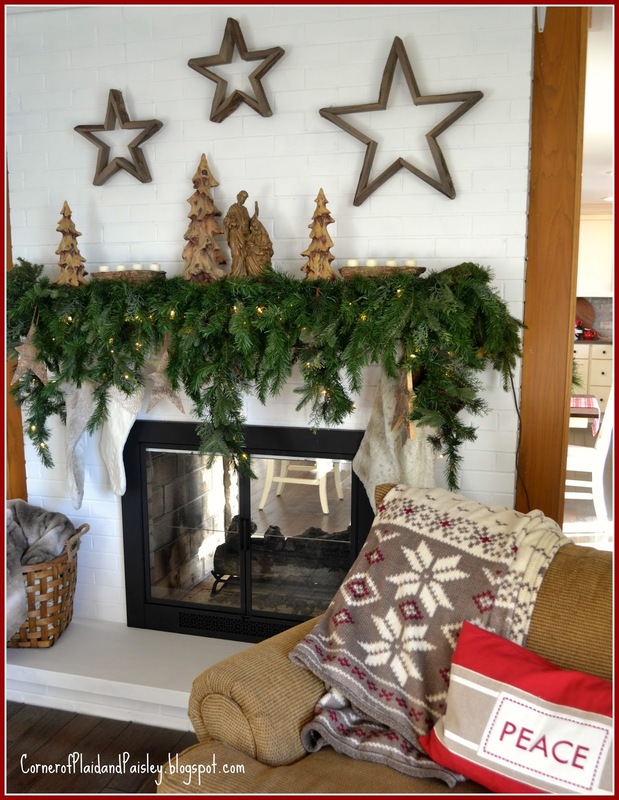 Those big stars on your fireplace are a fabulous idea!! Might have to steal that one. 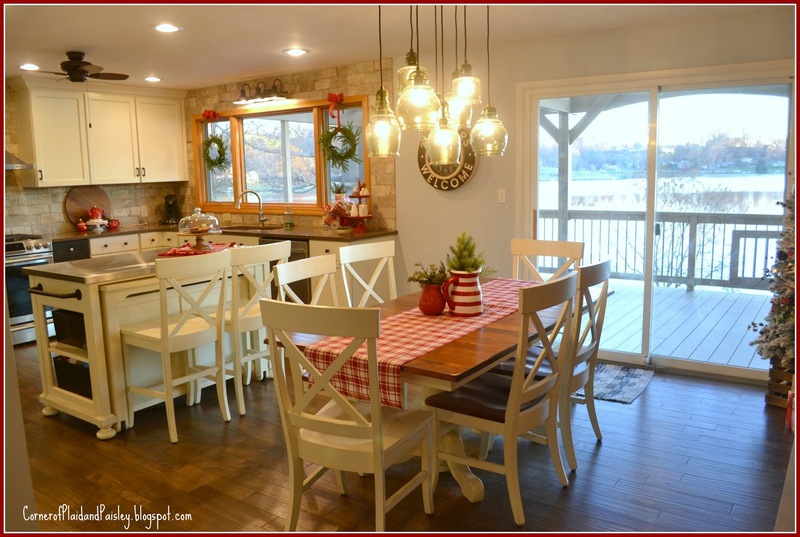 Love the red in the kitchen too. Ann, I would be thrilled to sit in your kitchen for an afternoon of conversation and coffee! 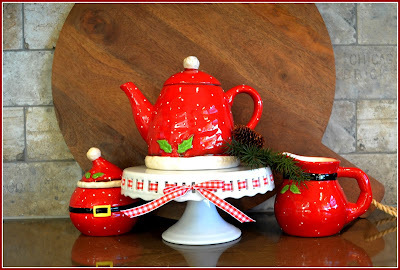 It is beautiful with all the pops of red, my favorite color for Christmas! I do love the open plan...the gingerbread houses are perfect for the kitchen mantel! The snowflake theme in the living area is wonderful, and inside the baskets they are magical! My favorite is the Nativity on your mantel...the true meaning of Christmas! Ann, I can't find your Instagram account. I wanted to share one of your images. Carol, you can find me on Instagram as annatcpp - that's Ann at CPP- Corner of Plaid and Paisley. I used to have Cornerofplaidandpaisley and it got hacked and I had to open a new account! I absolutely love the colors that you have used throughout your home. Your collections of Santas are my favorite. Your home is decorated beautifully and I know you are enjoying it. You hsve so msny pretty things but I have to agree with you that the ⭐️ Of the show is yoyr fireplsce. Your greenery and stars ✨ are just perfect. I love it! Merry Christmas! I was excited to see how you'd decorate your newly remodeled fireplace and I wasn't disappointed! 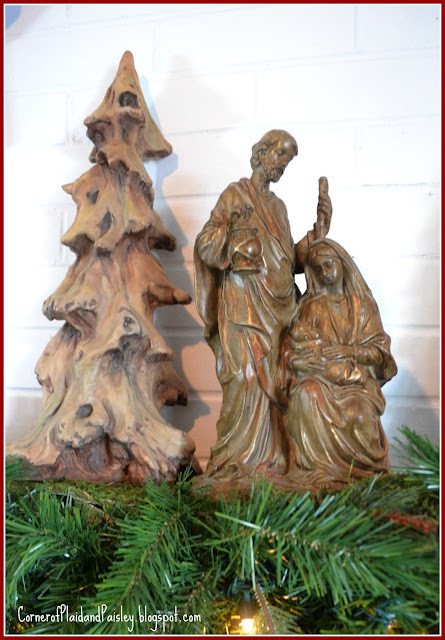 Love how you have that greenery hanging down and that you thought to let the "reason for the season" take center stage with that lovely Holy family display. The stars look wonderful as well. Putting those snowflakes in the baskets on the wall was a fantastic idea and looks amazing! What a great gingerbread house collection and your kitchen side of the fireplace looks good as well - the stockings really add to the look. 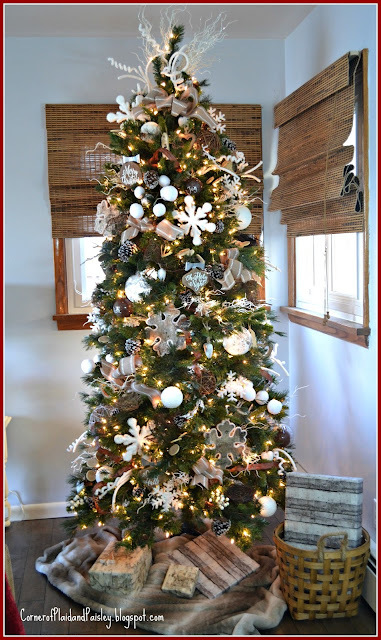 Your slim tree looks festive in that space and I'm sure you enjoy seeing it as you look out from the kitchen. 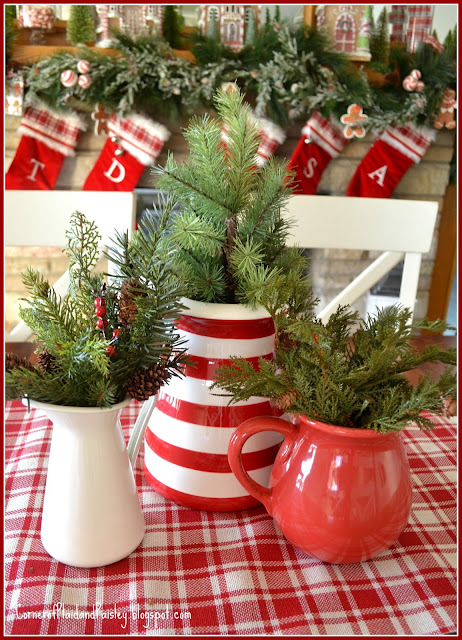 So enjoyed my stop here on the Blog Hop! Looks beautiful ! Love the mantle !great job ! Where do I begin? I love everything. You had me at "two-sided fireplace." Oh, you lucky, lucky girl! Everything looks just beautiful here, I feel like such a slacker I am so far behind. I love touches of red at Christmas, it always feels so festive. 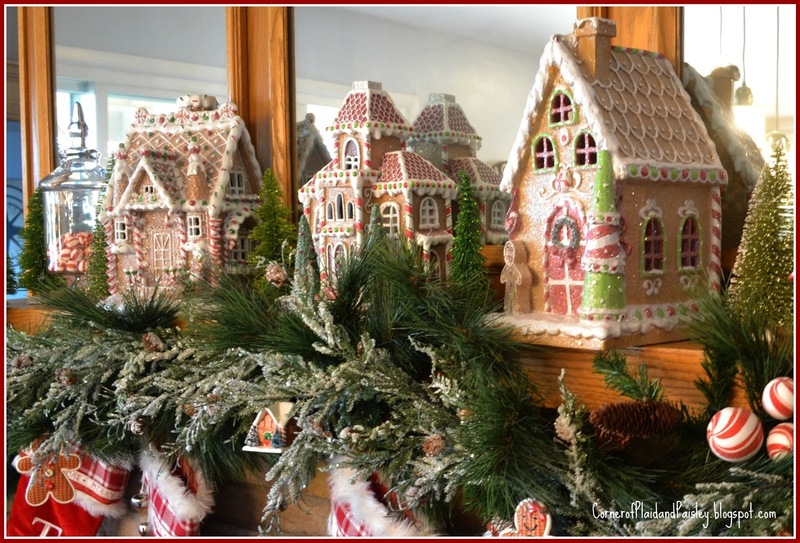 Your gingerbread house collection on the mantle is fantastic!. Everything looks lovely, Ann. Thank you so much for the blog visit and comment, I'm finding that styling this massive hutch is quite the job. Sadly, one of the towers has damage, and has to go back so I can't fill it yet. I am going to take your advice though on stacking plates. It's going to be so nice to get a lot of my holiday plates out all at once, and actually have a place to put them. Great post it was so much fun seeing your lovely home. Ann, it's all so pretty and festive! I would love a back to back fireplace as you have! 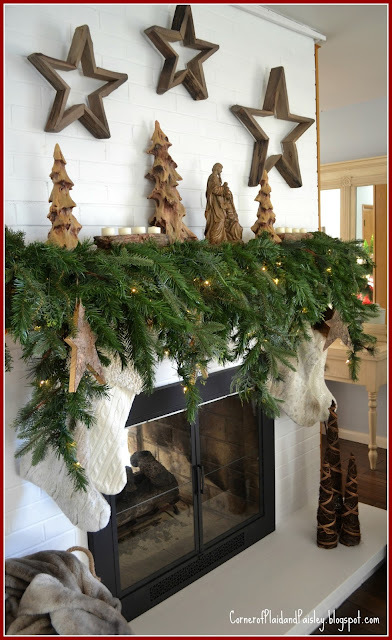 Two mantels to decorate = fun for me! Both of yours are charming! I considered making a gingerbread house this year. Will see how my time goes. Happy Holidays to you! Ann, I love your kitchen! 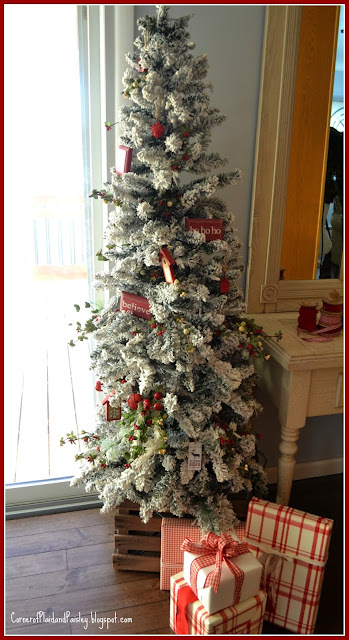 It is beautiful, and your Christmas touches are perfect! 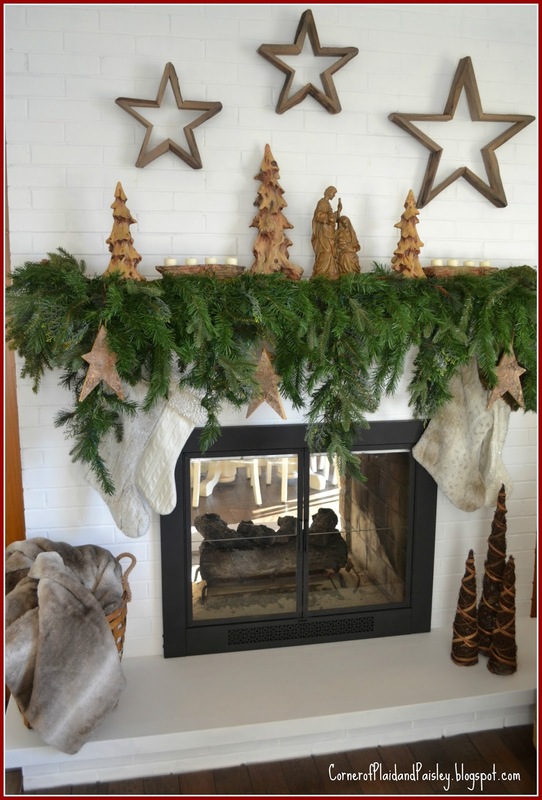 Your mantel is just gorgeous with the lush Christmas greens. Everything looks so bright, cheerful, and happy! I hope that you and your family have a happy and blessed holiday season!!! Beautiful, I love the snowflakes in the baskets too. They look perfect! How wonderful to have that fireplace in two rooms! I love that you have it right by your dining table! I absolutely love those little gingerbread houses, they are so cute! I had no idea you are in northeast Ohio...where are you? We still have a condominium in Lakewood! You look like you are ready to celebrate! The greenery is so lush on your mantel! Thanks for being a part of another blog hop and Merry Christmas!